Ally Week is important across the NYU community. Here, three students from NYU Buenos Aires, Matthew Gibson, Ellen Heaghney, and Maritza Rico, share how they observed this tradition. Matthew is a junior in Gallatin studying Globalization who chose to study at NYU Buenos Aires to improve his Spanish skills and take advantage of the internship program. Ellen is a junior in Global Liberal Studies with a focus in Politics, Rights and Development and a double major in Spanish. She chose to come to Buenos Aires for the full academic year to improve her Spanish and also because after taking a course on International Human Rights she became very interested in the political history of Argentina. Martiza is a junior majoring in Latin American Studies who came to NYU Buenos Aires to learn more about the history and literature of Argentina in preparation for writing her senior thesis. 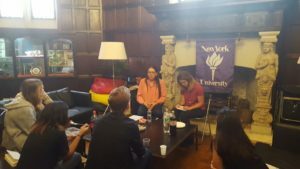 Ally Week in Buenos Aires, an annual tradition across New York University’s global network, culminated last week after three days of discussion of culturally specific approaches to allyship in Argentina. On April 11th, NYU Buenos Aires welcomed Argentine professor and Trans activist, Alba Rueda, to have a conversation with students about the history of Trans movements in the country and her current work on the issue. Rueda currently serves as the president of Trans Women Argentina in addition to her work with the National Institute against Discrimination, Xenophobia and Racism. Rueda set the stage for her discussion by explaining that although Argentina became the first Latin American country to legalize marriage equality, there still remains plenty of work in the fight for equality, for example the recognition of transgender identities in schools. She also illustrated a timeline of the relationship, fraught with tension, between the police and Argentine society, and in particular the LGBTQ community. She explained the persecution that arose during the last military dictatorship in the 70s and 80s and the ways in which traces of this discrimination are still very much present today. Rueda brought with her the personal testimony of a friend, who explained her struggle as a Trans individual in Argentine society. This individual was so often targeted by the police that she grew accustomed to being arrested, and even remembers being arrested three times in a single day. Her life was so often disrupted that she lost her job, and she always left the house with a change of clothes, just in case. Beginning in the 1980’s, social organizations emerged to tackle the issue of persecution of queer communities like what this woman faced. Over time these organizations gained influence and won important victories, but they faced obstacles as well. Argentina as a nation is heavily influenced by its Catholic history–not to mention that the current pope is from Buenos Aires. Catholic organizations were large opponents in the fight for equality and recognition, and Rueda still remembers the moment Pope Francis proclaimed that God was against them. Nonetheless, organizations like Rueda’s persevered, and with time were key players in important social change. In 2010, marriage equality was legalized, and in the following years rights for the queer community, especially Trans people, were increasingly protected. Soon, Argentine’s of any age were granted the right to change their name and gender officially on documents without any justification other than their own word. And throughout it all, those same organizations that fought for equality, were turned to in order to develop the content of new legislation. Today, Rueda emphasizes the importance for the Trans community of having role models–trans men and women who are respected and accepted in Argentine society. Of course, there are still many challenges and more progress to be made. But we are at a point that Rueda never thought she would see in her entire life. From her point of view, more people than ever before are comfortable going out into the streets and living their lives. Thanks to the hard work of community leaders like Rueda, positive change was achieved in Argentina. A particularly impactful part of the talk with Rueda was the important reminder that LGBTQ communities are specific to local cultural nuances. She reminded us that each community, although in theory universal, still holds specific spaces that need to be understood and studied with local lenses and historical contexts in mind. Today, they continue their work, part of which includes education and awareness, such as speaking to students like those of us at NYU Buenos Aires – teaching us all how to understand and contextualize Trans movements around the world, and be better allies moving forward. This entry was posted in Buenos Aires, Students. Bookmark the permalink.